Constellation Research keynoted at Ping Identity’s Cloud Identity Summit 2013 in July. Gathered in front of the Identerati, an Identity Manifesto was presented. The research behind that manifesto has been summarized here in this summary. The final big idea research report will offer insight into four of Constellation’s primary research themes, the Next-Generation Customer Experience, The Future of Work, Matrix Commerce, and the Consumerization of IT and the new C-Suite. Identity often means many things to many people for good reasons. Traditional definitions of identity for the identity and access management professional have revolved around standards for authentication, access, authorization, and management. While standards such as SAML, Open ID, OAuth 2.0 address the technical side, the rise of consumer and enterprise social networks has spawned a consumer identity that reflects a digital ubiquity of the individual. Facebook, Google, and Twitter now dominate most social logins. Users expect their identity to be transportable from personal to work environments. However, a limitation exists between personal and work worlds. In fact, the facets of one’s identity remain isolated and separated by not only our digital and analog presence, but also by our inability to deliver context across our worlds. Why? The lack of context separates our personal life from our work life and creates artificial barriers by role, relationship, and a host of other factors. The reality – identity plays a multi-faceted role for each individual. The business implications of identity after authentication, authorization, access, and availability touch on commerce, work lives, personal lives, and engagement with each other. Without a more comprehensive view of identity, organization and individuals will continue to undermine the strategic role of identity in the context of business. Identity is a unifying factor in the current transformation to a digital world. Identity plays a central role in the future of business and is a unifying point. 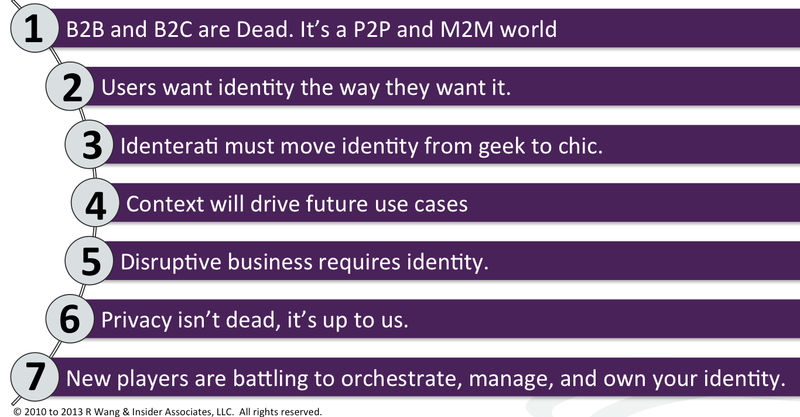 The seven points in the identity manifesto set the stage on the future of identity (see Figure 1). Identities inside an organization may come more from external sources and vice versa. Is a Twitter ID enough? Could one’s corporate identity allow access to stores or allow credit for mass transit fare? Will employees trust their B2B world more? Will a third party emerge so employees will not have to worry about their employer encroaching into one’s private lives? Would you use your corporate identity for access to your hotel loyalty program? As the individuals and organizations face a convergence of identity, trust is the currency. Transparency is the requirement. The reputation economy foreshadows a world of authentic commerce or business. However this world will require a trust, but verify approach because perfect transparency is impossible. The report is in it’s final stages of editing and will be available on the Constellation Research website in the next few weeks.